Peaty whisky used to a connoisseurs’ favour but it now becomes a popular trend and it means that the general consumers are willing to try something new and strange. It can be seen a positive move to overall standard of whisky tasting in long run. 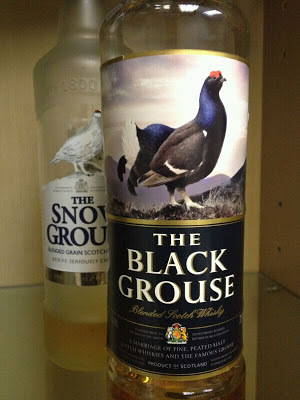 Black Grouse is the peated version of Famous Grouse. 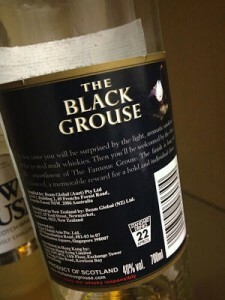 Black Grouse was firstly launched in 2007. This tasting note is based on the sample tasting in late 2012 though theoretically the difference amongst batches should be insignificant. For information, Famous Grouse series are under the umbrella of Edrington. What? You don’t know about Edrington? Have you ever tasted Macallan or Highland Park? It is rumored that Macallan and Highland Park are part of the components of Famous Grouse. There is another piece of information about the Black Grouse. The company draws a portion of profit from the sales of Black Grouse and contributes to The Royal Society for the Protection of Birds (RSPB) for funding of reservation of the black grouses, yes, the real living black grouses in wild. Whether they do this in good faith or just some sort of marketing idea, this act ideed is of benefit to the birds’ conservation. Here is the tasting note. Nose: Nectar, dried date, cereal, lightly smoke and sea breeze, vanilla. Palate: Preserved fruit, cereal, toast, hint of plastic, slightly salty, spicy Chinese prickly ash. Aftertaste: Medium length, overdone toast, plastic and Chinese prickly ash. Overall comment: Nice note, especially the refreshing cereal and nectar. Rather light body, feeling of cereal new make, doubtful the plastic or tar alike favor amounts to so-called peat, spicy hot at the end. Baking taste in aftertaste but trend to bitterness, plastic and tar persist. This Black Grouse is not thatexpected peaty whisky. Obviously this young grain based whisky is targeted at general consumer market, no offense. Nice nose and fairly drinkable but nothing more. Barely passed.